For the meat: Mix garlic, rosemary, balsamic vinegar, wine, olive oil, and black pepper to taste in a self-sealing plastic bag or a shallow dish. Add the meat, turning to coat, and cover or seal. Refrigerate for several hours or overnight. Prepare an outdoor grill with a hot fire for indirect grilling. For the marmalade: On a large sheet of heavy-duty aluminum foil (or a doubled piece of regular), toss the onions with the rest of the marmalade ingredients. Bring edges of foil up and crimp closed. Place package on the edge of the grill (over medium-high heat). Cook, turning the sealed package every now and then so the onions cook evenly until tender, about 45 minutes. Remove the meat from the marinade, pat it dry, and season generously with salt and black pepper to taste. Lightly oil the grill and sear the meat over high heat for 5 minutes. Then rotate it (don’t turn it over yet) about 45 degrees from its original spot on the grill. Once you’ve made your grill mark, flip and repeat on the other side. Move the steak to the cooler side of the grill, cover with an aluminum pan, and cook, rotating (not flipping) periodically, until a meat thermometer inserted into the thickest part of the steak registers 125 degrees F, about 15 to 20 minutes. 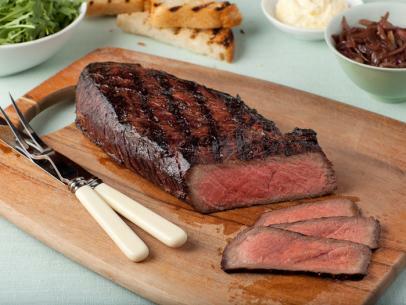 Let steak rest on a cutting board about 10 minutes. For the toast: Meanwhile, sprinkle garlic cloves with salt. With the flat side of a large knife, mash and smear garlic mixture into a paste. Mix with the butter. Lightly oil the grill, place bread over direct heat, and toast on both sides until golden brown, about 2 minutes total. Remove bread from grill and spread generously with the garlic butter. Thinly slice steak against the grain on an angle. Top toasts with onion marmalade, arugula, and sliced meat. Serve open-faced with mustard and/or horseradish.